As commercial real estate brokers in the San Francisco Bay Area, we have seen the open office plan morph and mature. Decades ago, the primary goal of open office plans was improved collaboration between team members. Removal of physical barriers between employees and management not only increased natural light, but also resulted in better communication between coworkers, yielding higher productivity and thus higher profits. prevents highly paid workers such as senior programmers, engineers and financial analysts from doing work that requires intense concentration. A corollary goal of the open office plan was improved corporate profits. The amount of space required for five workers in separate offices can seat 15 to 25 employees in an open plan configuration. Thus, leasing reduced square footage for the same number of employees is a big boost to any bottom line. Like airline passengers, employees are being crammed into increasingly smaller spaces. 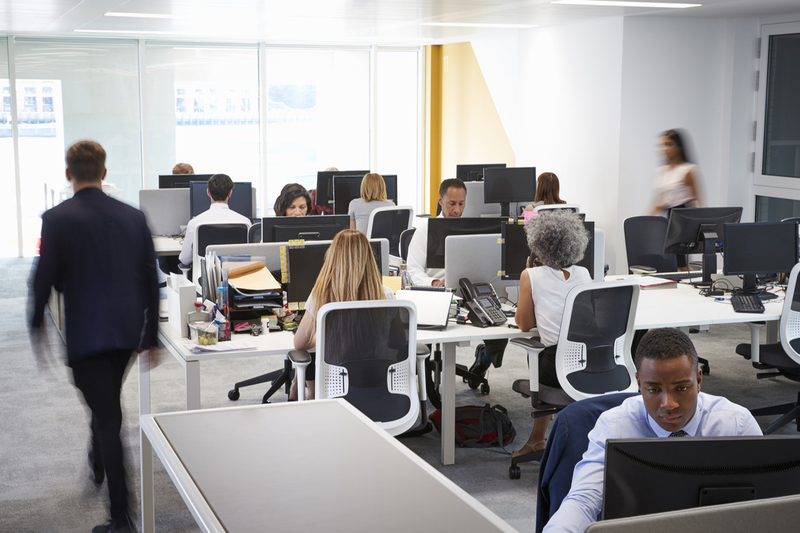 The same studies mentioned above demonstrate that savings in rent are offset by employee downtime, increased sick days and high worker turnover, each a direct result of open offices. Despite the negatives, open office plans now account for 70% of all office space, including co-working spaces such as WeWork. On a positive note, open office plans do impart a youthful, progressive vibe to companies seeking to attract talent in addition to saving on rental costs. Workforces have become increasingly blended with full-time, part-time, contract, and remote workers. Hot desking (bench seating and desks assigned daily on a first-come, first-served basis) and hoteling (desks and conference rooms reserved using software) add another layer of complication and instability to open office design. On any given day, there can be open seats in companies with employees who travel frequently or work from home. Hot desking and hoteling do optimize a reduced office footprint by trimming rent, heating, cooling and lighting costs. Also, when executives participate in hot desking, a corporate culture is genuinely transformed. After employee salaries, the second largest expenditure for any company is office rent. In markets where rental rates have been on the rise for ten-plus years, and for companies whose employees travel many days a month or work from home, then open office plans, hoteling and hot desking make a lot of economic sense. When transitioning a work force to an open office plan, the most effective ways to increase employee satisfaction with open office plans and hot desking is for company leaders, prior to the change, to communicate enthusiastically their vision of fostering creativity, increasing collaboration, promoting informal communication, and how the open space aligns with the work to be done. Advance preparation is key!